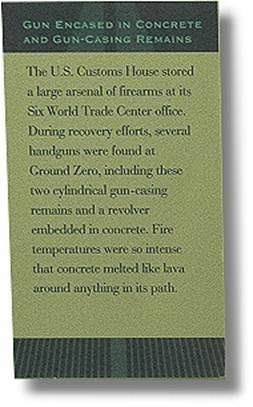 These photos are from a current New York Police Museum display of recovered firearms that had been stored by the US Customs House inside WTC6, prior to and during 9/11. 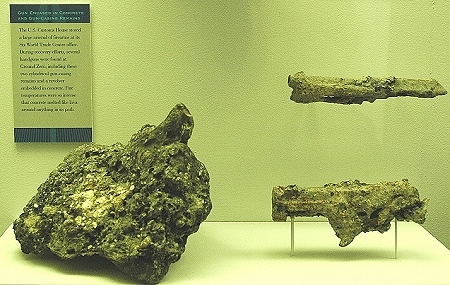 As the actual display sign indicates, the entire hand gun on the left, and two pistol barrels on the right are completely embedded in a mass of solidified concrete, melted by the intense fire and liquefied so that it flowed “like lava”. What they have neglected to consider is Jet fuel and office contents can produce a maximum burn temperature of 1,800 degrees, over 1,000 degrees cooler than the sustained 3,000+ degree burn temperatures required to liquefy construction grade concrete. Therefore, this becomes one more of the countless items of absolute evidence that the fires were far hotter, and burned far longer than jet fuel could possibly produce. Once again, the laws of physics must be suspended for the official government cover-up story to be believed. metamars on Thu, 01/08/2009 - 9:43am. Again, shouldn't this be front page news!? Physical evidence showing the official story is bogus yet again but gets relegated here. Why? Swingdangler on Thu, 01/08/2009 - 11:07am. metamars on Thu, 01/08/2009 - 1:35pm. >>Dr. Greening was good enough to reply. FYI for readers, this is the Dr. Greening who is a co-author with Bazant to refute demolition, even as he is superficially critical of NIST to appear "neutral". Journal of Engineering Mechanics ASCE , Vol. 134 (2008), in press. Refutation of controlled demolition theory. Discusses matching of video record with progressive collapse equations, "free-fall" claims, concrete crushing (and how much TNT equivalent would be needed to do that crushing), air pressure & ejection of air, spread of dust cloud. Greening can often be found on JREF forums to try to refute demolition claims so I'm not sure what's so "good enough" in terms of his reply. Victronix on Fri, 01/09/2009 - 3:23pm. If it walks like a debunker, and quacks like a debunker... shoot it! It's great to see that these clever professional debunkers are not fooling the Truth movement any longer. douglas wagner on Sat, 01/10/2009 - 6:44pm. What do you mean "superficially" critical?? Greening doesn't lean towards the CD hypothesis of WTC 1 & 2. Should he lie about his convictions, so as not to have people like you call him a "debunker"? As you know, Greening has criticized Professor Jones' claims about microspheres, and suggested ways to determine whether they are from the fly ash component of the concrete floors, or not. Were those criticisms and suggestions "superficial", or were they serious, scientific criticisms and suggestions? Try not to be superficial in your answer, OK? Nobody cares your suspicions about hidden agendas on Greening's part, at the expense of rational answers - at least, not if they're scientifically serious. Finally, Greening was kicked out of JREF some months ago, where he posted as Apollo20. He was the target of some rather vicious "debunkers", who were about as rational as some CD true believers that I can think of. metamars on Sun, 01/11/2009 - 7:08pm. Should his article be stricken from the journal, as Victronix has determined that he is "superficially critical"? metamars on Sun, 01/11/2009 - 10:08pm. Debunkers have said it's not molten concrete, referring to paper in the chunk. (Scroll down the page.) I'm not sure, but to me it looks like the paper is *on* the "meteorite", as if it had landed on it after it had cooled down somewhat. Hey, let's go to the bottom of this, ok? Vesa on Thu, 01/08/2009 - 6:46pm. The NYPD have put these artifacts on display in their museum. It would be a logical assumption that these chunks of solidified construction concrete encasing guns have been examined by many of the department's personnel, including forensic experts. And yet, the exhibit with the description "fire temperatures were so intense that concrete melted like lava around anything in its path" still stands. I would be amazed by the lack of concern about the obvious and inescapable implications, except I have come to realize that the world simply doesn't give a damn about who attacked us on 9/11. douglas wagner on Thu, 01/08/2009 - 10:58pm. compressed, compacted, (inaudible) exposed to temperatures as high as the inner earth. Sitting-Bull on Sun, 01/11/2009 - 8:20am. ... for some scientist members of the movement to actually visit the museum, talk to the curators (? ), try to get permission to analyze samples, etc? Vesa on Fri, 01/09/2009 - 3:33am. jkeogh on Fri, 01/09/2009 - 2:59pm.